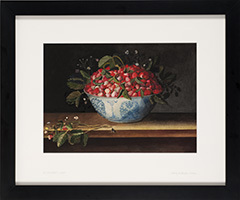 For nearly twenty years, Nancy Becker has painstakingly replicated—in watercolor—paintings by the great German, Flemish and Dutch flower painters of the 16th and 17th centuries. It is said that copying is considered the highest form of flattery, but in her watercolors, Becker elevates that process to the level of homage. There can be no question that she reveres these painters of the past with their staggering ability to create precise visual analogues, images that rival the real world from which they derive. Indeed, the degree of verisimilitude they possess calls to mind the famous story told by Pliny the Elder, wherein one Greek painter of the 4th Century B.C. painted grapes so realistically that birds flew down from the sky to peck at them, whereas a rival painter rendered a cloth on his canvas so perfectly that it fooled no one less than the painter of the grapes. Similarly, Becker’s watercolors should be compared to the source paintings from which they derive, whereupon we can only marvel at her ability to recreate every form and nuance of the original picture. 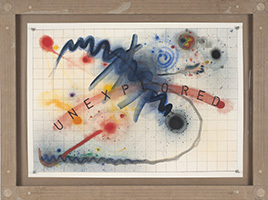 She calls her paintings “translations,” for although she attempts to duplicate each detail as accurately as possible, she changes the medium from oil to watercolor, thereby subjecting the image to an entirely new visual vocabulary, resulting in an appropriation whose significance and meaning naturally changes as well. 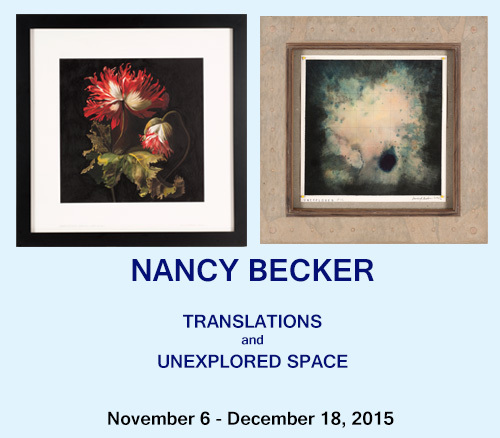 The process of replicating these pictures is time-consuming and arduous, and Becker seeks relief through an entirely different and nearly antithetical approach: she paints visions of space, an imagery that is derived entirely from her subconscious, allowing her imagination to freely probe and visualize the outer dimensions of our cosmos. Ever since Einstein, it has been a goal of science to create laws that govern the smallest elements known to man—atoms with their nuclei and encircling electrons—that are in keeping with the movements of everything else in our universe—which includes the planets, stars and galaxies known to exist. In a manner of speaking, Becker accomplishes this monumental task within the confines of her studio, extracting from the inner depths of her mind visions from the outer confines of space. In these pictures stars, black holes, asteroids, comets, solar explosions and planetary bodies of varying sizes are rendered with such convincing precision that—just as when viewing her flower paintings—we can almost believe they exist. Indeed, since so much of our universe remains unexplored, it would be impossible for anyone to prove that they do not.